What would you do if you had 24 hours in New York? Well, that recently happened to me, and it just so happened to be my birthday that day, too. Being a person born two days after Christmas isn't always the most fun, but it does have it's perks. Perks include: everything being decked out and festive, fun Christmas/ New Years things to do, and snow. The cons include places like Bryant park ice skating rink being SUPER packed, everyone traveling/ being out of town, and snow. I put snow as a pro and a con because while I love it, not everyone does. So here's what we did given those points. Come along on a day in New York with me! 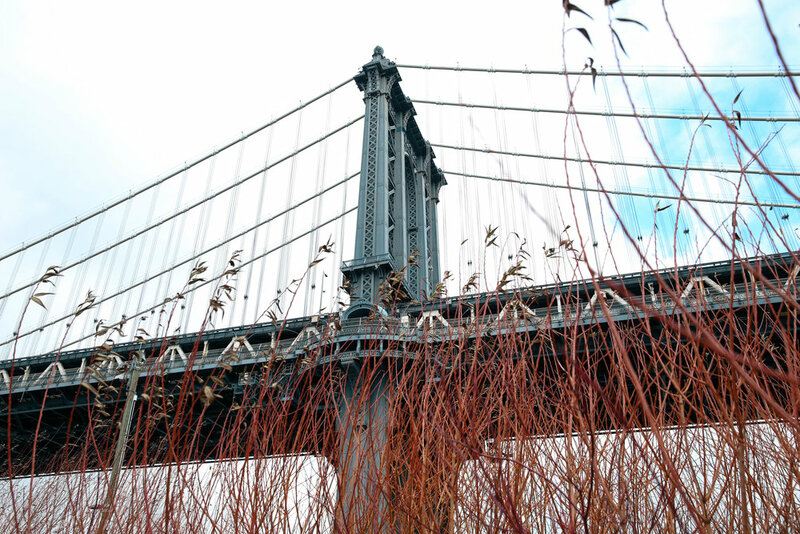 To start, we decided we wanted to explore a new part of the city I hadn't seen before, so we headed to Brooklyn. The day started with a coffee from Sweat Shop, the cutest little coffee shop a stone's throw from the main drag in Williamsburg. The Avocado Toast with fried egg and bacon at Sweatshop NYC - amazing for post-birthday celebration hangovers! Hot coffee and a pink beanie will warm up even the chilliest of New York days. I decided to wear all pink on my birthday, because it's my favorite color right now and I'm really into monochrome dressing at the moment! Why wouldn't you wear all pink when given the choice, am I right? I actually wasn't cold during the day at all with a beanie and second layer under the sweater, and over the knee boots are surprisingly practical for walking around the city and keeping your legs warm. A backpack is a great way to carry more stuff than a cross body will hold while still being portable and chic. After coffee I changed into jeans and a long camel coat, because this California girl was getting COLD. Our friends Cole and Caroline then took us over to Dumbo, which was another first for me. If you've never been, for sure go to this area to check out the views! We also stopped into a few shops, one of them was an awesome vintage store where I swooped a 1970's silk scarf and tried on these 80's french sunglasses. Flower marts in NYC are the best, and they're at basically every corner. After we explored Dumbo, we headed to Manhattan for some more site seeing and dinner. First we (attempted) Bryant Park for outdoor ice skating, but it was wayyyy too busy. We had to settle for sipping on a whisky on their patio while watching the ice skaters instead of participating, which was obviously totally fine. After taking in the ice skaters at Bryant Park it was time for dinner, and we headed for Bill's Townhouse, an upscale French style dining experience I will NEVER forget. To say our meal was decadent would be an understatement. We were truly spoiled and everything was absolutely incredible. We noshed on everything from oysters to lobster and steak. SO GOOD! I can't wait to go back. 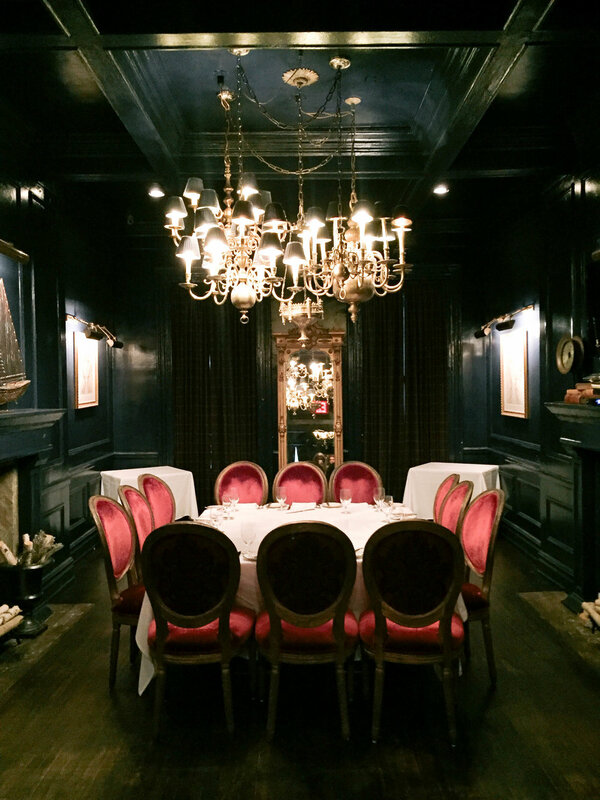 The private upstairs dining room at Bill's Townhouse, NYC. We sipped on Old Fashions while we perused the menu. The rest of the evening consisted of bouncing around some of New York's awesome bars and enjoying the evening with friends, much of which is a little fuzzy and I don't have the greatest pics of, ha! That being said, I could not have asked for a better day in New York, and can't wait to be back! All in all, it was a great success. We ate, we drank, we shopped, and it was perfect. What are some of your favorite things to do in the Big Apple? I'd love to hear for my next trip! All images in this post courtesy of Brian Gove for The Style Sauce, copyright 2017.